This is the ultra-enhanced digital version of the comprehensive, 12-week TRX Tactical Conditioning Program used in all branches of the US Military and by athletes of all levels to get the most out of their training. Featuring an extensive, indexed exercise video library, a randomized workout selector, benchmark tests, optimized countdown timers and agility and conditioning drills, the TRX FORCE Super App will push you beyond your limits to get you fit for whatever mission you face in your line of duty—or life. The Super App now features an additional four-week pull-up program and integrated timers that adjust to the volume of your music, so you’ll never lose track of your workout. The TRX FORCE Super App contains the most comprehensive and effective tactical strength and conditioning program ever created. To develop the TRX FORCE Super App, we leveraged learnings from our direct work with thousands of service members in every branch of service and the most recent, cutting-edge science and research published on the application of functional training for tactical athletes. The TRX Tactical Training Program at the Super App’s core provides a robust training solution for anyone at any fitness level ready to take on a serious challenge and experience serious results. Choose between the original workout flow where you manually progress from exercise to exercise, or Auto-Advance where the workouts come to life (for both the 12 Week Program and the Pull-up Program). • Each workout has timed sets for each exercise with rest and transition time built in. For rep-based movements you manually advance once the reps are completed. Fixes issues with video playback. I loved this app and planned on writing a glowing review... until the update. The recent update removed the expectation for each exercise (e.g. 45 seconds or 10 reps each leg) - it is now all based on time, which only becomes apparent if you “begin workout” and severely limits self-pacing. Also, the videos won’t load at all. I work out at a gym without WiFi or phone coverage, so I’m sure that has something to do with it, but the new design really hurts the whole interaction. I have even tried loading the videos at home with WiFi and the program appears to try to load it but won’t. Bottom line - you broke an awesome app that’s pretty expensive. Please fix! After purchasing the app I looked everything over. Two weeks in I realized it included the pull up improvement program! How in the heck I missed that I'll never know. 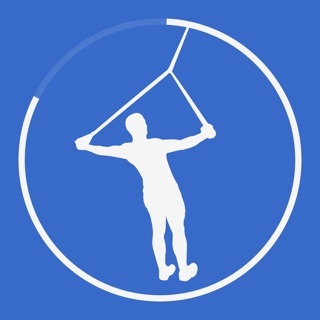 Being new to suspension trainers I took a leap of faith with this app. I like the format that the program lays out for you to follow. Being able to preview the exercise video directly from the program helps when you're not sure what you are supposed to do. Looking forward to completing the entire program and checking my fitness levels after! To me it was worth the price paid. Manual advancing mode is back! Now it shows the duration and reps for each exercise and you can manually choose them again. If you liked the auto advancing mode, you can choose it in the setting menu. The video performance problem was fixed, too. Thank you for listening to us! This app would be even better if the timer sound is not tied to the phone ringer volume/mute setting and has it’s own setting. I sometimes put my phone in the mute mode and get confused, or set to the max ringer volume and startled while wearing a headset.